Just because you’ve conquered the galaxy doesn’t mean you can take a vacation. There’s still work to be done, uprisings to quell, and glory to be gained – as well as loot. Speaking of loot, the Galactic Command system has taken more lumps than a petty dictator following a coup. I wrote about some of its issues, and how they could be corrected, last month. While I don’t think BioWare read that piece and used it as a template, the company is well aware of those shortcomings and will be taking steps to address them in Update 5.1: Defend the Throne, which hits servers tomorrow. There’s also new content and lots more to come, and we were able to score some time with Creative Director Charles Boyd to talk about some of the additions and changes. MMOBomb: So, who are you defending the throne from? Charles Boyd: With Knights of the Eternal Throne, players have risen to a position of prominence over the galaxy. Depending on their light side/dark side choice, they’ve either become a ruthless dictator or more of a benevolent leader. Either way, you’ve got this very powerful fleet and the power of the Eternal Throne behind you. There are a lot of people in the galaxy who are a little wary of that, so they’ve started to spark these uprisings across the galaxy. Players experienced the first five of those uprisings with Knights of the Eternal Throne at launch, and now, with Defend the Throne, they’ll be experiencing the next five uprisings, with some cool new game mechanics and features to really set them apart. MMOBomb: What’s the level of storytelling in these instances? CB: They’re definitely “story-light.” They’re meant to be about the action, though there is a kind of story context about them because you’ll get tidbits and hints about what’s really behind those uprisings, that there’s an individual or individuals that are really pulling the strings. That’s going to set things up for the rest of the year. MMOBomb: Are you worried maybe a little bit about “story fatigue”? We’re going on several years now with the primary storyline, most of the same characters, villains, set pieces, etc. Do you think there’s a need to go in a new direction with your next major story update? CB: Yeah, with the defeat of Valkorian, that definitely means we’re going to be taking our story in a very different direction. Of course, he’s been our core villain for many years, the guy behind everything. We definitely see the story going in a new place, facing some new villains that are really going to be set apart from Valkorian, to get back to some of the really core Star Wars kinds of themes. These uprisings are going to start pointing in that direction and the update after that is when we’re really going to kick that story off. MMOBomb: I see that you’ll be implementing Master Mode for the Eternal Throne story chapters. They’re meant to be a greater challenge, but what are the rewards for that challenge? CB: They’ll have better Command XP rewards for completing them. Speaking for myself, though, the reward for a heavy challenge like that is completing the challenge. It’s the same reason you play any BioWare game in the hardest difficulty mode, to prove that you can do it, for the achievement. And there are also achievements, of course! MMOBomb: Now, on to the Galactic Command System! When we talked last time, Ben Irving admitted that things might not be perfect right out of the gate and there would be some balancing required. So the first thing we heard about was the Command XP for gold mobs being cut from 10 to 1 (and later 2). Why did you feel such a drastic cut was necessary? 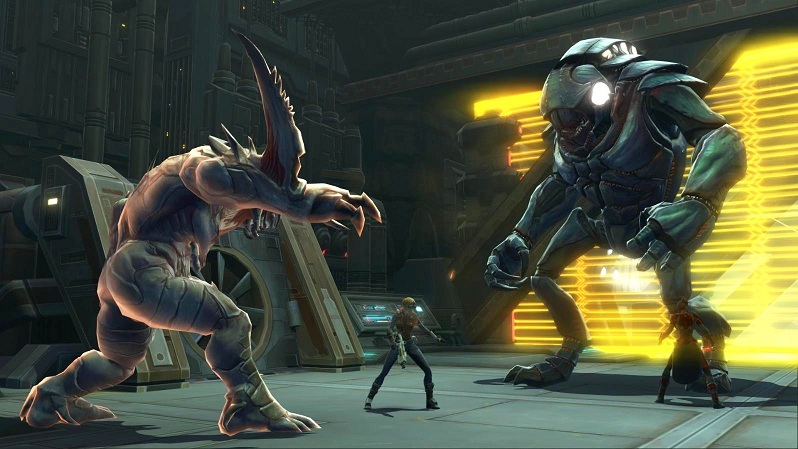 CB: It was really just a way of making sure that the best ways to get CXP were also the most fun ways. There were a lot of instances where there were a ton of gold mobs you could just kill over and over again, and it made that more profitable than playing uprisings or playing operations which, to us, are much more fun. MMO players are going to be looking for the fastest way to do it, and if the fastest way to do it is really lame, they’re going to get bored and leave the game, so we tried to make the fastest way something that’s actually entertaining. MMOBomb: What other methods do you have to track how much CXP something should be worth? Can you give me some insight into the process that goes into balancing that sort of thing? CB: We wouldn’t go into every metric we follow, but yeah, we keep track of how many people are at each rank every single day, the rate at which people are gaining CXP, which activities and which sources of CXP people are using, so we can tell what are the most-used venues for getting CXP. We can combine all of that and look at it over time to chart that out. There are definitely more changes we’re going to be doing, which we’ll talk about next week, but we’re also looking at CXP in operations in patch 5.1, and we’re going to continue to adjust those values as needed. MMOBomb: What else have you learned about the Galactic Command System since its implementation? Anything else on your “watch list” that you’re keeping an eye on for possible future adjustments? CB: Operations are next, and then we’re looking pretty hard at flashpoints. That’ll be a more in-depth balancing pass; there’s a lot of variety to flashpoints compared to any other content type, in terms of enemies that are present, overall challenge, and all that. That might take a little more doing, but we’re in it for the long haul! MMOBomb: What about PvP as opposed to PvE? Are you finding a good balance between those two? CB: I think if anything, the perception right now is probably that PvP is a little better than PvE. 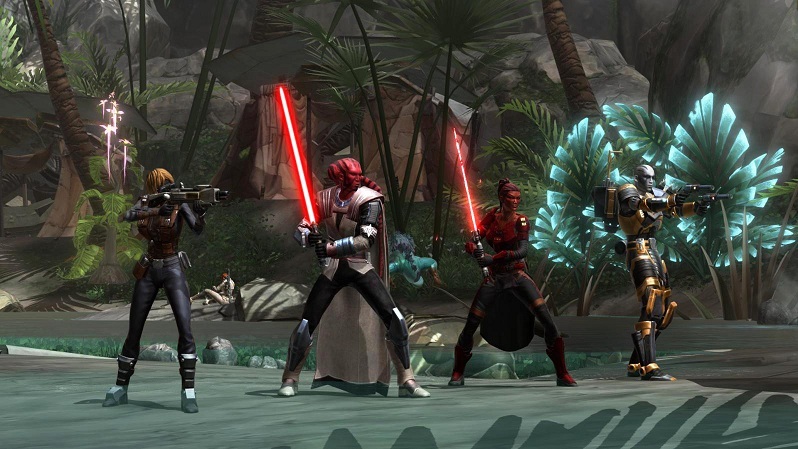 PvP feels pretty good, so if anything, we’re going to be buffing some of the PvE to make it more competitive. MMOBomb: What about the rewards themselves? I’ve seen people bring up the randomness as being pretty unpleasant, so how do you intend to improve upon that? So we’re adding some features into the update to facilitate that, especially to let players who are looking for the highest-level gear though the highest-level challenges, like operations, the ability to find specific pieces. Some drop from operations bosses, and then each Command Crate you get as you level still has a chance of getting that awesome gear and will also drop tokens which you can combine with unassembled gear pieces you can turn in to get actual pieces of gear. So if you get the unassembled helmet that drops off of Revan, you can combine that with a set number of tokens and get the helmet that’s appropriate to your character. There’s also a way of doing that with PvP as well. We think this will be a great first step toward making all of that gear accessible. MMOBomb: How about gearing alts? That’s been a lot tougher with the Command Crates being account-bound. CB: We definitely see that as another point where players have had a lot of feedback, and we’re looking at some improvements. 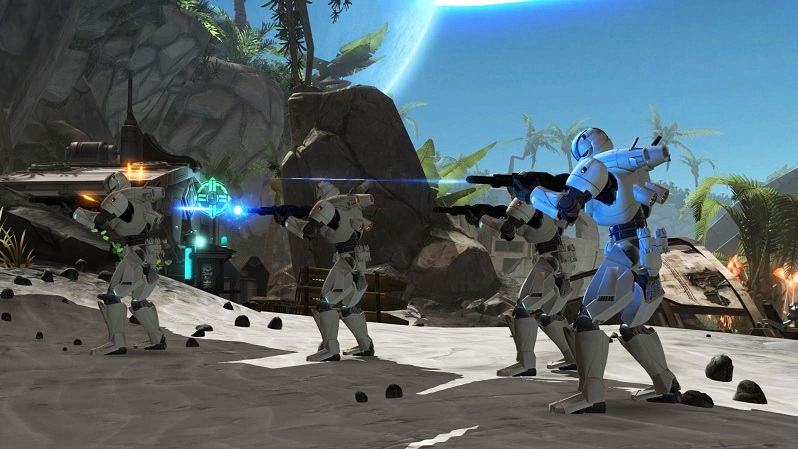 We’re adding legacy perks that players can get on each character that raise their CXP gain rate by 10%. We’re also going to add boosts that players can get in-game, without any real-money expenditure. They’ll be available with the same tokens you use for the gear, and they’re bound to legacy, not to character, so you can share them with your alts. That’s just the start, though. We feel like that’s not a full fix to the situation. We’ll be talking a lot more about that for the next update, but next to getting specific gear and buffing/changing CXP gains, speeding up and making alts more rewarding is our next big initiative. MMOBomb: So overall, the Galactic Command system you came out with last year was like “Galactic Command 1.0,” and you’re going to need to iterate on it for a while before it’s exactly what you want it to be. CB: Yeah, I think we took some chances with it. We wanted to try something very different that we thought might be really interesting. In a lot of ways it is, but in a lot of ways, players were really looking for something different out of it, and that’s totally fair. We’re here to serve our players and give them the game they want to play, and we’re going to make whatever changes we need to in order to make that happen! Thanks for your time, Charles! 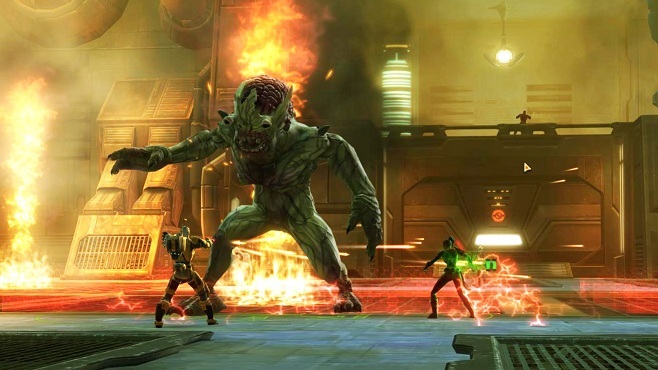 Star Wars: The Old Republic Update 5.1: Defend the Throne goes live on Tuesday, Jan. 24. Das ist noch mal eine geniale Idee und die 12 EUR sind ok, da ja der MVV den Flughafen auch in die Ã¤uÃŸerste Zone gelegt. So eine Ovesvight-Rerernierung fÃ¼r Abfahrten, z.B. bis 06.00 Uhr oder so wÃ¤re noch eine prima ErgÃ¤nzung um die morgendliche Hinfahrt zum Flughafen noch kalkulierbarer zu machen. I know they need money but this is pretty much just a show of desperation. This is what you get when you mix Star Wars with World of Warcraft.